Israeli soldiers abducted, on Monday at dawn, six Palestinians in Jenin, Qalqilia and Tulkarem, in the northern part of the occupied West Bank, the Palestinian Prisoners Society (PPS) has reported. The PPS office in Jenin said the soldiers invaded and searched homes in Jenin refugee camp, and abducted Samer Abdul-Karim ‘Oweiss and Rami Qotnat. It added that the soldiers also abducted a former political prisoner, identified as Mahdi Nour Amarna, from Ya’bad town, west of Jenin. 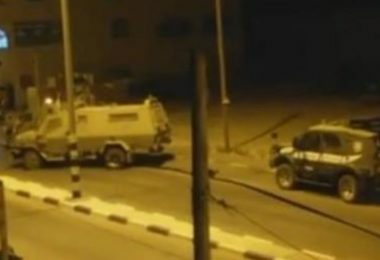 The soldiers also invaded Qalqilia city, in northern West Bank, searched homes and abducted Shadi Bassam Abu Shareb, 30, and Taher Nofal, 20. Furthermore, the soldiers invaded homes in Nour Shams refugee camp, east of Tulkarem, and abducted Mo’men Fathi Qar’awi, 24.